The Storm Greeter Peel & Stick (SGPS) can be produced to our customers’ specifications, in widths up to 6′ wide and 108′ long. It can be die-cut into whatever shape is required. We typically produce SGPS in 2′ wide rolls, in lengths of 20′ and 24′. SGPS can be produced in thicknesses ranging from 32 mils up to 125 mils. The edges can be tapered to zero, if required, if shedding rainwater is an issue. The SGPS has a life expectancy of 50 years. The annual coating cost per square foot is reduced by as much as 50%, while labor is reduced by as much as 90%. Storm Greeter is a heat-cured polymer. We began working with Storm Greeter in 2006 as a coating for construction fasteners and components. The coating is corrosion proof! It is inert, non-porous, UV and abrasion resistant, and remains flexible for the lifetime of the substrate. In fact, it’s so flexible that it can be twisted 360 degrees without cracking or delaminating from the substrate. Heat curing Storm Greeter in a factory setting is fine, but when it came to coating very large substrates, or coating those substrates in situ, practicality became an issue. A serendipitous moment occurred when we had to devise an abrasion test. The best way to do it was to pre-cure a sheet of Storm Greeter and blast it with a 12 gauge shotgun. There we were, a shotgun in one hand and a sheet of Storm Greeter in the other. What if we could just wrap the pre-cured sheet to a substrate? After much trial and error we hit upon VHB technology. VHB is used by Toyota, Honda, Audi, and Volkswagen to connect steel panels when the use of rivets and screws won’t do. They require the VHB interface to have a lifespan of 25 years before they will use it. 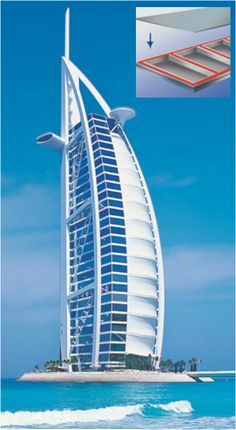 Probably the most notable and visible application of VHB technology is the Burj Al Arab Jumeirah Hotel in Dubai. This hotel is located on a man-made island off the coast of Dubai. It is covered with aluminum panels. VHB was chosen to attach the panels to the building because of the intense heat, humidity, and high winds. The aluminum panels are constantly expanding, contracting, and moving. The VHB holds them in place, where screws and rivets would corrode, rust, or just tear through the aluminum. Ovante developed a way of applying the VHB to the pre-cured Storm Greeter sheet. That method is now patent-pending. The SGPS goes on quickly and requires a clean surface. No mixing, no chemical fumes, and minimal PPE.